It has been many years of joy reading news and books using such a great invention that our ancient egipcians called "per-peraâ", later on renamed as "papirus" by the greeks, "papyrus" but the roman empire and more recently "paper" by the english who speak English. But now it's time to say "goodbye paper!". Modern electronic-ink and books will of course compete, but this weekend I found a much more lethal enemy for our lovely paper. The digital camera. I was thinking how to get rid of all those books I've been collecting over the years and that have slowy been deposited in my bookself. You know, all those books you don't think you are going to read in the next comming years/life but are too good to leave appart. But our 3D space is finite and sooner or later we must surrender to the evidence. There is no place anymore for them. And so, no without pain, I started to think about how to digitalize all their pages before burying them into the obscure junk room where they will rest in peace. My intuition told me that if I wanted to digitalize something I had to scan it, and nothing is better to scan than an scanner... but my intuition was wrong. I tried with my first book and *slow torture* is the only way to define my experience. Nearly 30 seconds per page, and that multiplied by 300pages on average per book was something I just want for my worst enemy. Even more, placing the correct frame per page was all but easy and around one over fives times, I failed to properly place the page in the scanner so I had to reposition the page in the scan and repeat. Frustated as I was I deciced a second strategy. A few weeks ago I bought a cheap camera for arround 120€. Nothing great for such price, but still with a maximum 12Mpx marketing resolution. I was amongst those who thought 12Mpx is an aberrant pixel definition for a camera, but for once such an army of megapixels made my day. I tried to take a shot at a page and compare the result with that of the scanner. Not without surprise, the result was much better. The foreground black text looked sharp with a yellowish background. The shot took about 7 second per page and the previous problems to place correctly the page in the scanner vanished in the air. Scanning with the camera was so fast that it took me no more than 1 hour to digitalize a 300 pages book, and with jpg compression the final space was about 200 Mbytes or around 1/2500 of my 500 external USB HD. But the real test came next. 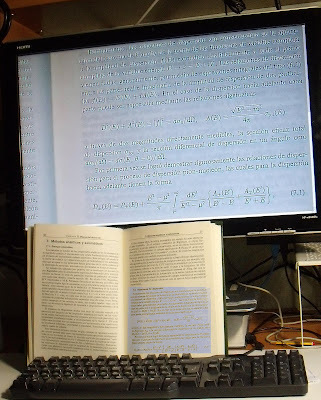 Reading the digitized text on my 24" screen and comparing with a normal lecture on paper. It was then that I realised paper had become past (and great) history. The difference in favor of the electronic option was so big that I can't think to go back to normal paper in the rest of my life. My eyes were much less fatigated and I could read the pages at nearly two meters of distance. Suddendly all the pages had become a PowerPoint. Next come a picture that tries to reflect what I'm speaking about. Up is the text in the 24" monitor, down in blueish color that same text in my old friend "the paper". (The picture camera senses the monitor 60Hz refresh rate and some strange distorsion effects appear on this picture that are actually invisible to the human eye, specially the aurea around the letters).